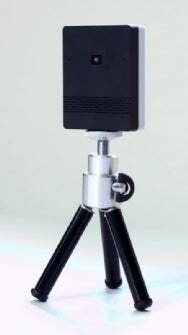 Ecamm Network announced Monday that it is shipping its BT-1 Bluetooth wireless webcam. It costs $149. The webcam works with Macs, and streams 640 x 480 pixel H.264 video at 15 frames per second, as well as 48kHz stereo AAC audio. It will work from 10 to 30 feet away from a Mac equipped with Bluetooth capabilities. The BT-1 supports Bluetooth 2.0+EDR. The BT-1, first unveiled at Macworld Expo in January, measures 2 x 2.5 x 5/8th inches and has an internal rechargeable battery that lasts for about four hours per charge. It recharges connected to a Mac or other device using a mini-USB cable. The BT-1 also comes equipped with a standard 1/4-20 tripod mount.